It was half past four. The rehearsal had finished at four but Genevieve and Fintan were still there, bickering about faith, meaning, and Genevieve's supposed religious vocation. Fintan went for a wander on the stage. He'd had enough of banging his head against a wall. Genevieve was unmoved - as fixed as the Northern Star - obstinate and obsessed. But then again, he mused, weaving his way between the statues and columns, so was he. Fintan approached the dais and picked up the crown - a golden, gleaming circlet. He held it in his hand, fondling and caressing it, longing for Ambrose, Archbishop of Canterbury, to appear like a ghost from the stalls and ease it onto his head. Someone would crown him one day, no matter what Shakespeare said in Julius Caesar. He was twenty-seven, and consumed with ambition. To be hailed as a legend - a king among princes - the foremost Shakespearean actor of this second Arthurian age. That was the prize. That was what it was all about. Fintan put back the crown - for now - and followed her out of the theatre. Sunlight stung his eyes and wind nipped his cheeks, as the raw March air snapped him out of his royal reverie. Down the cobbled hill, to his right, the big ships shimmered in the harbour. Waves bounced and sparkled in the setting sun. But Genevieve turned the other way, uphill through the narrow streets and the Old Port's celebrated mesh of cafés, pubs, galleries and music halls. The breeze whipped her long dark hair across her face. Seagulls cawed and chattered overhead. Down below, the place was buzzing, stuffed to the gills with good time Charlies from all over the Empire - sailors, showgirls, scholars, seminarians, you name it. The town had gone from strength to strength since the Great Restoration, no doubt about that. There was still some damage showing from the war, of course. It was only five years ago, after all. Where the Castor and Pollux hotel once stood, for instance, was now a boarded up plot of empty space. The plywood boards, Fintan saw, as they passed by, were festooned with posters for all manner of books, performances and exhibitions, including one for their own play, Julius Caesar - seven-thirty every night at the Gaumont from March 10th to March 31st. Valentina Ivanovna, the Director, had drawn the poster herself - a depiction of Fintan reaching up for a crown - the same circlet he had just been holding - that hovered and hung in the air, eluding his grasp like it was sitting in a pocket of time and space all of its own. He was there again in the top right corner, in a kind of inset, his blood-soaked form lying crumpled at the foot of Pompey's statue, the conspirators looming over him with their reddened knives. Fintan frowned. It was a nice picture - stylishly done - but Valentina had made him look distinctly non-regal. He would have a word tomorrow. They turned right at the Round Table café onto Charles Stuart Boulevard. The new British flag - a rearing red dragon on a backdrop of gold - billowed and fluttered from the wrought iron lampposts. It was here, four years previously, that Alfred II had led the first of his Reconciliation Walks, comforting the bereaved and healing the wounded with his touch. His son and successor, Arthur, had processed through the town just last year. Alfred and Arthur had visited Fintan's home town, Leicester, too, but he had missed them on both occasions. Four years ago he had still been a Prisoner of War in Minsk, and when Arthur came he had been preoccupied in looking after his parents. He had never seen a king. He felt it acutely - almost as great a loss - more in many ways - than the left hand he had lost in the war. They walked past the Art School. Its Doric columns reminded Fintan of Valentina's stage set. That was another reason, he realised, why he felt so intensely at home in the Old Port. It had high culture and low culture but nothing middlebrow - no mediocrity, no bourgeoisie, no middle class. Genevieve felt it too, he knew. She had an integrity, a passion for quality and a spark of nobility, that set her apart in his eyes. He had lost so much in his life - his Mum and Dad last year, his hand, his comrades and friends - that he couldn't bear to lose Vivi now - not when he was just getting to know her; not with the chance of a few days together in the Old Port after the play's run. Somehow or other he had to divest her of this tomfool idea of becoming a nun. A bizarre sight in the Throne and Altar pub opposite distracted Fintan. A wiry, bald little fellow, surrounded by a clapping, cheering crowd, was balancing a pint pot (it looked like Guinness) on his head. Then Genevieve jinked past him and was gone. 'Come and see' was all he heard her say. Fintan was at a loss, swamped by a sea of Mass-goers, streaming past him on either side. He wanted to bolt - cross the road for a pint and a smoke and cheer the wee chap on. But someone had taken his arm, he didn't see who, and spun him around. Into the church. 'Just sit down for a while, son,' a gruff Northern voice growled in his ear. 'It'll be alright.' Rough hands shoved him into a pew - the back one on the right hand side. By the time he got his bearings, Fintan had lost all sense of who it might have been who had manhandled him. He drew a deep breath and drank in his surroundings. Fintan was surprised by the size of the church. It had a wide, spacious feel that worked like a tonic on his nerves and gently settled the chaotic beating of his heart. He looked down the nave, his eyes drawn to the six tall candles on the Altar, then up to the curve and swell of the dome. A remarkably life-like mosaic - Christ washing the disciples' feet - swept across the ceiling in gold, white and blue. Our Lady's appeared to Fintan as if ablaze in candlelight - from top to bottom - on the Altar, in the two side chapels and in front of the countless statues. Incense permeated the air. A profound silence - penetrated only by the tolling of the bell - restored rhythm and depth to his breathing. The church was about two thirds full - a good mix, so far as he could see, of young and old, male and female. Some of the women and girls wore white, lacy veils. Genevieve, he noted, remained bareheaded. He could see the back of her head, on the left hand side, about four rows from the front. She was kneeling down, her attention absorbed in a pocket-sized, gold-leafed book. The great bell fell silent. Fintan heard a faint tinkle, then everyone stood up. Male voices, high above, struck up a slow, meditative chant. Far away in the front left corner, a silver crucifix followed by four flickering candle flames edged steadily forward, bobbing up and down over the worshippers heads. Fintan lost sight of the procession momentarily, only for it to reappear beside him, sweeping past him on his left as the Servers, with the Priest behind them, approached the Altar for the start of Mass. Fintan counted five Servers - one very old, one very young, two about his own age, and one (the cross-holder) whose face he didn't quite catch. They wore black, overlaid by a white, tunic-type garment. The Priest was a burly, tough-looking individual, with close-cropped hair and stubble to match. If it hadn't been for his long purple vestment, Fintan might have had him down as a bouncer rather than a cleric. The Priest and his Servers genuflected in unison before the Altar. The cross-holder slotted his crucifix into a small square plinth to the Altar's right. The candle-bearers peeled off, two to each side, while the Priest and the cross-holder stood motionless in the centre. They turned around together, as the chant rose, fell and rose again like the waves in the harbour. They marched down the aisle, the Priest sprinkling the people with water from the cross-holder's brown jar. Fintan saw the Server's face now. He had a cruel-looking scar - curved like a scimitar - across his left cheek. Fintan felt oddly certain that he had come by that scar in the war, just as he had lost his hand and - worse than that - Jan, Marco, Adam, Brendan, and so many more. Schoolfriends and comrades. The best (and only) brothers he ever had. He felt a deep and sudden affinity with the Server. The Priest too. They were men - just as he was - and in that instant he wanted nothing more than to be part of their fraternity, to feel again that bond of brotherhood he had known at school, at the front, and in the camp at Minsk. Holy water splashed him in the eye as Priest and Server passed him by, and Fintan saw that he had been searching for this brotherhood - this sense of meaning, this intensity of feeling - ever since his release but in totally the wrong place - in in a vain and futile quest for individual glory and renown. Worse, he had projected his deepest spiritual and emotional desires onto Genevieve, a woman whose destiny clearly - and rightly, Fintan saw now - lay in a completely different sphere. The Priest and Server returned to the Altar, and the Mass began. The congregation knelt down, and Fintan knelt with them. He couldn't understand, and in any case could hardly hear, the Latin prayers going on at the front. The Priest had his back to the crowd anyway. But Fintan didn't mind. No-one, least of all himself, had come here to be entertained. There was the whole of the Old Port for that. It was a relief as well, to be honest, not to be looked at by the Priest. Fintan didn't want the Mass to be about him or the people beside him. He wanted the Priest and Server to keep their focus on the Altar. It took some of the pressure off that he used to feel in church (on the few occasions that he went) before the war. A new chant started up - female voices too now - Kyrie Eleison, Christe Eleison, Kyrie Eleison. Even Fintan knew what that meant - Lord have mercy, Christ have mercy, Lord have mercy. The words felt right and fitting. The follies, sins and errors of his life flashed before his inner eye. He hid his face in his hand and prayed to God for mercy and forgiveness for the first time since his capture and blindfolding. The longer the Mass went on, the more it felt to Fintan like he was waking up from a long period of madness. Their was something in the way the Priest and Servers moved together - the Servers standing so close to the Priest as he incensed the Altar - left side, right side, centre - that gave Fintan the sense of being present at something real - something sacred and substantial - a genuine, living mystery. He was astonished. It was all such a far cry from what Mass had been like before the Great Restoration, when it was still said in English and the Priest faced the people. Those Masses, Fintan recalled, were well-meaning, but banal. They didn't compel him - didn't captivate him - and he had gone elsewhere to find meaning and value. But now he felt like he was coming home - home to himself and home to the truth. A new world - surprising and strange, yet deeply familiar as well - was opening out like a flower before him. Everyone stood up. The Priest ascended the carved pulpit, candle-bearers beside him, and chanted the Gospel. Everyone sat down, and the Priest gave his sermon - short, sharp and clear. He had a Liverpool accent, not quite as strong as Genevieve's, but similar in tone and intonation. Fintan wondered if they knew each other. The sermon was on the temptations of Christ and the seductiveness of worldly power and prestige. Staying true to ourselves and staying true to God are one and the same thing, the Priest said. Our deepest desire - what we long for more than anything else in the secret recesses of our heart - that's the key to who we are, and that's God's deepest desire for us too. We need to take steps, therefore, wherever and whenever we can, to build a culture and society that's congruent with this true self. 'We become what we contemplate,' he concluded. Pleni sunt caeli et terra, gloria tua. Silence descended. The Priest bent low over the Altar. Fintan had the impression that something momentous - something earth-shattering - was about to happen. The Priest lifted the Host high into the air. The man with the scar struck a great silver gong - once, twice, three times. The Priest genuflected, bent over the Altar again, and lifted up the chalice. Its golden gleam caught and held Fintan's eye, as the gong rang out again. And Fintan felt a presence - something (or someone) totally outside himself - wholly other - existing beyond the confines of his mind - his projections, plans and schemes - beyond everything he knew about himself, yet intimately linked somehow with that deepest, reallest, truest self the Priest had spoken of in his sermon. The gong sounded for the fifth time. The chalice hung in the air still, cradled in the Priest's hands, hovering, it seemed, between this world and the next. It drew Fintan's eyes up to the dome and the white-robed, kneeling Christ, washing a reluctant St. Peter's feet with His towel and bowl. Fintan gasped and shuddered. The mosaic, with the clarity of a thunderbolt, showed him in a flash what true Kingship really means - not being hailed as a legend, the foremost man of the age, and so forth - but sacrifice, service, and love - acting, in other words, as a brother to your people. King Arthur II knew this well. His father, good King Alfred - the Restorer - knew it too. Fintan saw now that he had actually been involved in a lot of this throughout his life - a sacrifice, service and love that he had both given and received in great measure - at school, in the Army, and most of all, perhaps, in his parents care for him as a boy and his care for them when they were ill. Something softened, then snapped inside him. Ice broke and melted. The memory of his school-friends, his comrades, and his Mum and Dad was too much for him. Fintan buried his face in his hand again and wept for the first time since Jan, Adam, Marco and Brendan fell at the Siege of Tallinn. The gong resounded for the sixth and final time - booming, echoing, resonating, then fading. Fintan beat his breast three times. 'Kyrie Eleison,' he whispered. 'Christe Eleison, Kyrie Eleison.' The Priest genuflected, stood up again, and carried on with the Mass. Silence enveloped the church once more. A triangle of light - brightening, dimming, then brightening again - steadily lit up the stage. Fintan let go of the dial. Three-quarter light was fine. He didn't want it too bright. He jumped up onto the stage, striding purposefully between the statues and columns. Valentina - in that earnest, Eastern European way of hers - had given each of the actors what she called a 'secret key', so that, as she told them, 'you can come to this place - this sanctum, this sacred space - at any time of day or night to better connect with the play, the characters, and yourselves - as actors, human beings, and children of God.' Fintan, in his arrogance, had chuckled to himself at the Director's flamboyant speech. He'd thought he had all the answers in those days; both for himself and for others. He knew better now. The Mass had taught him that. Fintan took up the crown - Julius Caesar's deepest desire - and held it in his hand. He heard a click behind him and turned around. There, in the wings, illuminated in a halo of light, stood the tall figure of Genevieve. They looked at each other for a long time in what should have been total silence but wasn't quite. Genevieve must have left the door open. The sounds of the Old Port at night - seagulls, cheers, and clinking glasses - stole through into Valentina's sacred space. It was right and fitting, Fintan felt. He remembered the little chap with the pint pot on his head and smiled. They laughed together, and Fintan threw her the crown in a looping, swooping arc. For a moment, mid-way between them, it seemed to pause and hover in the air, hanging there - a spinning band of golden fire - sitting in a pocket of time and space all of its own. Fintan looked closer, rubbed his eyes, and looked again. The crown appeared different to him - no longer a circle, but a curving bridge of molten light - a bridge between levels - between Heaven and Earth, the human and the Divine, the ego and the Self - a bridge of healing, unity and reconciliation - a bridge between Fintan's splintered post-war consciousness and what he longed for more than anything else in the secret recesses of his heart - quality, nobility, purpose, fellowship, and peace. 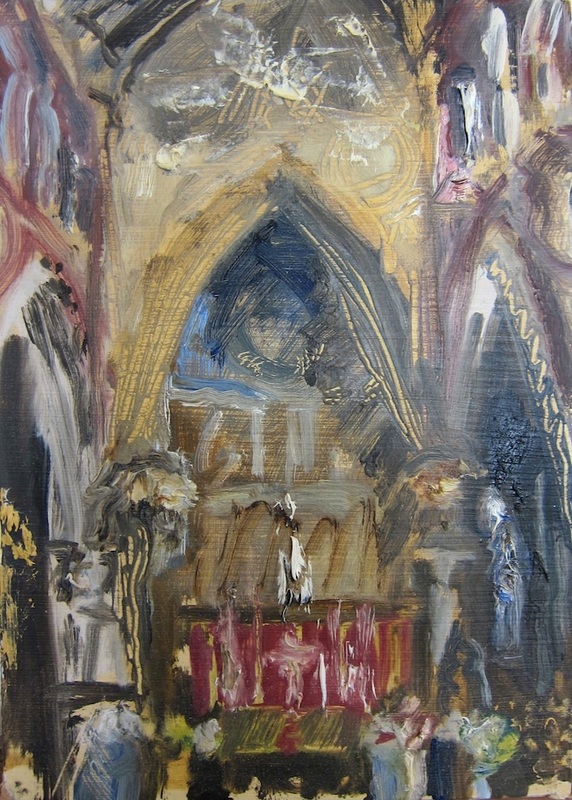 The painting at the top of this piece is Low Mass at All Saints, London (2013) by Timothy Betjeman. Please visit www.timothybetjeman.com to see his whole All Saints series and many more. You've surpassed yourself with this story, John! - Sublime. This is really, really good. I'd love to see this expanded into a slightly longer story. I particularly enjoyed your portrayal of the Old Port, where "the Catholic sun doth shine", in the words of Belloc. If I had to make one mild criticism (coming from someone with no storytelling ability whatsoever), it's that while Fintan's epiphany is beautifully written, it comes too soon. It's not that we need his detailed backstory, but that we only get a glimpse of his alienation before it's gone. As a result, his conversion at the Mass has less dramatic effect than it might. But this is quibbling. Thanks very much, and God bless. Thanks very much, Bruce and Murray. I'm glad you feel the story made an impact. All best wishes, John. Nicely done. I would enjoy spending more time in this tale's world, particularly reading about the Restoration War. Thanks Carlos. Your 'Omega Crusade' looks of great interest. Good luck with your writing, John.